This edition of the monuments spotlight will deal with the most prominent monument on the Rathcroghan complex, the feature known as Rathcroghan Mound. Despite the use of rath in it's naming, the mound does not seem to have any defensive or martial background. Through the application of a wide range of geophysical survey techniques, a very complex, multi-period set of connected features were uncovered that has caused scholarship to re-evaluate the place that the medieval literary landscape known as Cruachan held in Iron Age and medieval Ireland. I say this because, as recently as 1994, one of the prime indicators or characteristic features of a 'royal' site, such as Emain Macha, Tara, or indeed Rathcroghan, was the presence of a prominent ritual 'enclosure'. 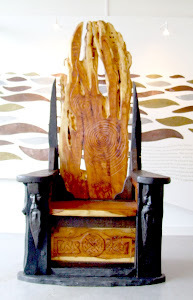 The feature was deemed present at all of the traditional royal sites, except for Cruachan (Raftery, 1994, p. 70). 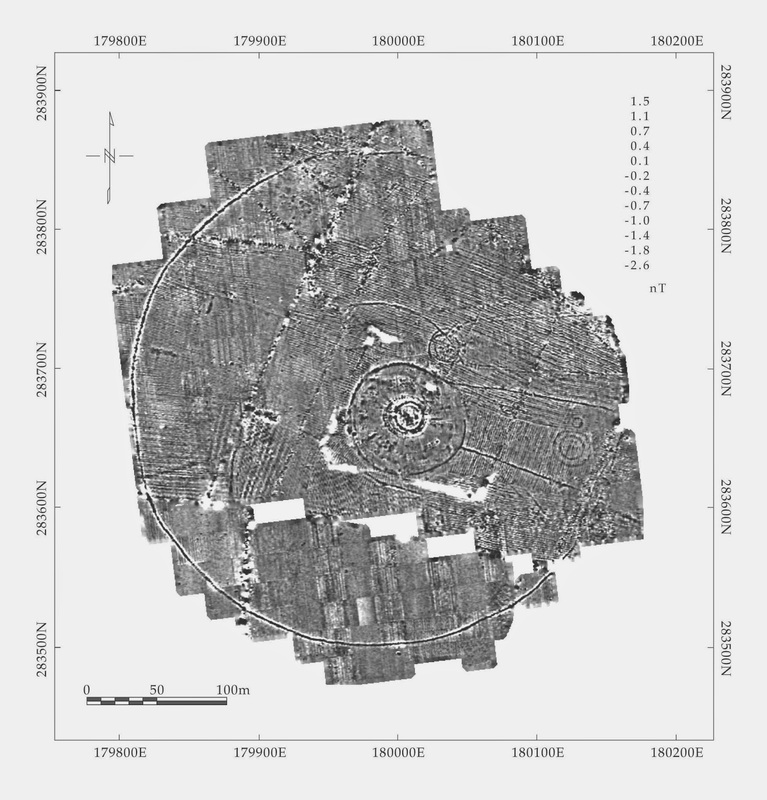 Through the application of a magnetic gradiometry survey on the mound and it's vicinity, as well as analysis of aerial photographs from as early as 1983, the presence of a very large enclosure was uncovered, roughly 360m in diameter, around Rathcroghan Mound (Waddell, Fenwick, Barton 2009, p. 142). As well as encompassing the mound itself, it also contained a number of other features, some of which can be readily identified in the below image. These include a feature which surrounds the immediate environs of the mound, an attached avenue, a seemingly earlier feature within said avenue, as well as a smaller, more northern parallel monument, with similarly aligned avenue. All of this points to a protracted period of use, as well as some reinterpretation of the environment during its period of use. In keeping with the discoveries surrounding the monument, the mound itself is a very complex feature. Extending 88m in diameter and rising on average 5.5m above the surrounding terrain, which is already 140m above sea level and a high-point of the glacial plateau, the summit of Rathcroghan Mound provides commanding views of the surrounding territory. Given the very deliberate placement of the monument here, it being the highest point in the complex, gives us some indication of the role that Rathcroghan Mound had in the society it was created for. However, before engaging with it's possible function, some further detail on its make-up is required. In summary, an electrical resistivity tomography (ERT) survey produced evidence in the centre of the mound for a large sub-circular area, which seem to be the remains of a glacial ridge or cairn-like dump of stone. Aside from this, a further ERT survey uncovered evidence at three separate depths of 50cm, 1.5m and 2.5m of what seems to be a pair of concentric stone walls at approximately 22m and 35m in diameter. These provide an interesting comparison with the excavated evidence at Emain Macha or Navan Fort, where the lauded 40m structure was seemingly buried to produce the later mound. 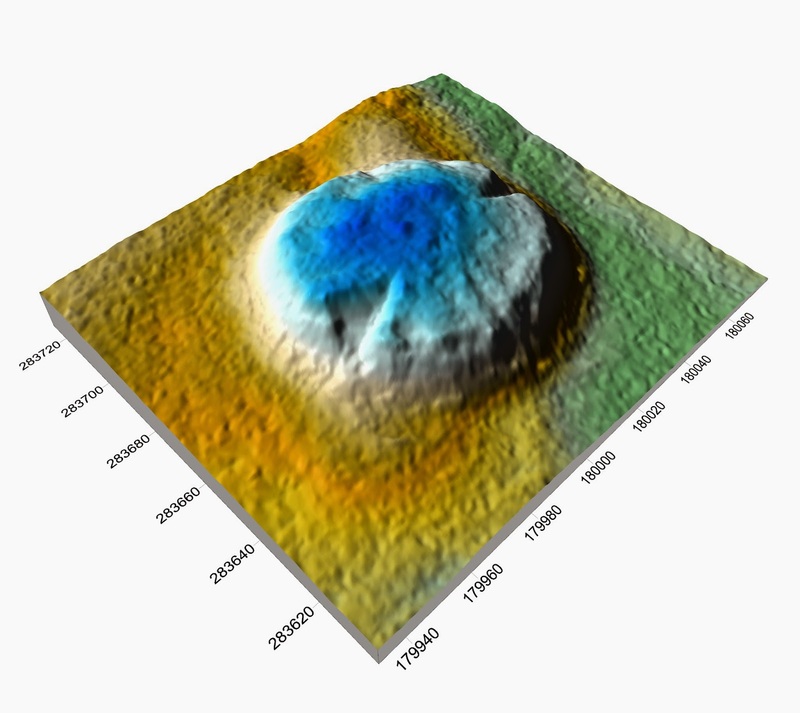 A further, higher resolution magnetic gradiometry survey of the summit suggests evidence of a broad series of enclosures or structures placed on top of the mound, perhaps dividing the summit into different ritual precincts. Suggestions of a large timber structure on the summit would indicate a later episode of the monuments life. 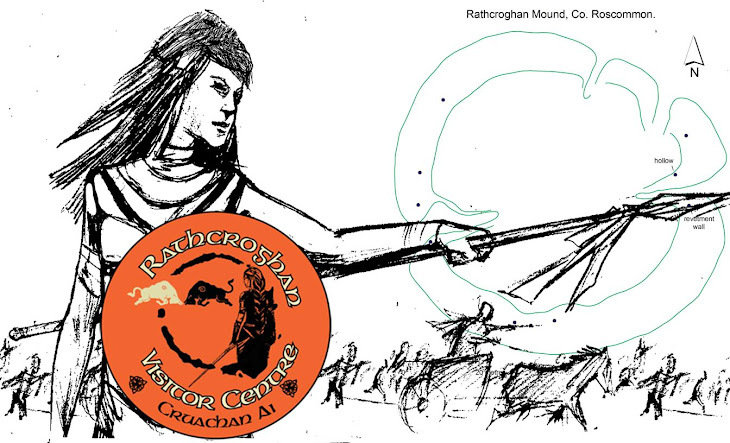 Even through this annotated description of Rathcroghan Mound and it's environs, it is clear that it served a range of interlinked ceremonial roles during its perhaps multiple periods of use. That function seems to focus on ritual activities, and given it's prominence in the landscape, the view of it as a focal point of a great assembly or óenach is a convincing one. It's use as a place of inauguration is not beyond possibility either, despite the fact that any such practices at the site must have ceased in prehistory, (Fitzpatrick 2004, p. 82) with the monuments of the Carns complex taking up this role into the medieval period. Daniel Curley.